Do you like playing volleyball out on the lawn? If so, you need a surface that can withstand wear and tear. That’s why synthetic grass for volleyball is a smart option. It stays in great shape with little upkeep and costs much less to maintain than live grass. If you decide to make the switch, keep in mind certain volleyball tips for playing on synthetic grass for volleyball. These volleyball tips for playing on a synthetic lawn will help you get the most out of your artificial grass. At Watersavers Turf, that’s always one of our main goals. That’s why our team is happy to share these tips for playing on synthetic grass for volleyball. Setting up a volleyball court in the backyard involves certain key steps. Choosing the right surface for your artificial turf volleyball court is important. The ideal artificial turf volleyball court should be designed for athletes. You want strong fibers that aren’t easy to damage. Luckily, many styles fit this description. Our experts will gladly help you choose the right product for your artificial turf volleyball court. Next, you’ll want to decide where the court should go on your lawn. A regulation volleyball court measures 18 meters by nine meters. You might not have enough flat space on your lawn for something that size. If so, measure how much space you do have and reduce the size if need be. Keep in mind that you may be adding other features around the court, like storage space for gear. The following are some extras you may want to include in your plans. You’re much more likely to be happy with the end result if you list all the features you plan to install ahead of time. 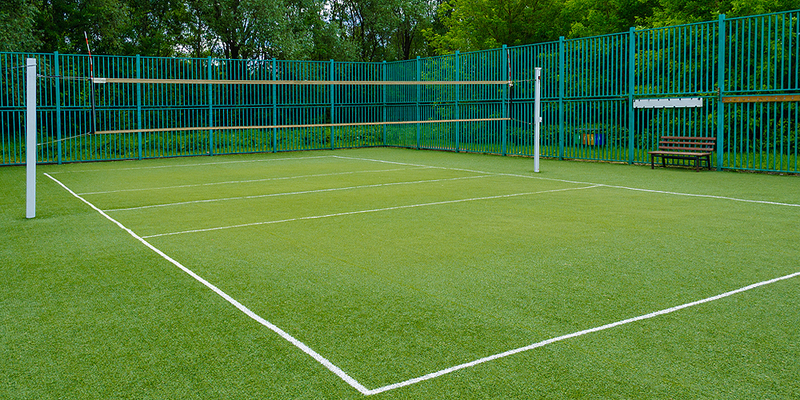 Ask your turf supplier what type of paint they suggest for adding lines to the court. Boundary lines will make the field more authentic. Don’t like the idea of only playing during the day? You don’t have to. The right lighting lets you keep playing long after the sun has gone down. Choose strong lights, but make sure you point them slightly downward. If they shine directly in players faces, they can be very distracting. Some prefer to install fencing or another type of enclosure around the court. This is often useful for volleyball players. The fencing will prevent stray balls from rolling away all the time. That said, some people prefer to leave the court open. This may be the better option if you plan on taking the net down from time to time to use the lawn for other activities. Consider whether you’ll ever use the court for something other than volleyball before you decide to add a fence. Your volleyball court will be a big hit with guests. That’s why you might want to add an outdoor bar or lounge space nearby. Giving them a place to rest or enjoy a refreshment in between games will make your backyard parties even better. You can also use this space to store gear. Some people use their backyard volleyball courts strictly for volleyball. Others may have several uses for their lawns. If you’re that type of person, buy a portable volleyball set-up. You can easily find packages that use weights to hold down the poles. This allows you to take them down when you’re done playing. On the other hand, if you’re a serious volleyball player, ask the contractor about installing holes in the sports turf. They’ll provide a permanent spot for the net poles. Luckily, a sports turf volleyball field won’t require much upkeep. You’ll never have to water or mow it. Unlike live grass, sports turf won’t get torn up during a game. It even drains more quickly than live grass, so rain won’t make it too slick. You may need to rake the blades back up if they get matted down, but that’s a low-effort task you can do quickly before or after a game. To learn more, visit one of Watersavers Turf’s SF Bay Area locations. Our experts will provide the materials you need to transform your lawn into the perfect backyard for a volleyball fan. We’ll even offer free large 1’ x 1’ turf samples. They’ll help you choose the ideal style for your needs. If you can’t make it to us, no problem. We ship our products to any spot in the Continental United States. Call us toll-free at 844-974-8873 if you have any questions, or chat with us online. Don’t forget to ask about our free estimates! With our help, planning your backyard volleyball court is easy.